MOSCOW—Red Square is one of the world’s most iconic locales. Even during the worst of the U.S.S.R. the square was more symbolic than threatening. For the most part no one went to the Kremlin to die. Very different, however, is Lubyanka, just a short walk away. In the late 19th century 15 insurance companies congregated on Great Lubyanka Street. The Rossia agency, one of Russia’s largest, completed its office building in 1900. But in 1917 the Bolsheviks seized power. They nationalized insurance companies along with much of the rest of the economy. As a result, the Rossia building at No. 2 Great Lubyanka Street became the property of the new secret police, known as the All-Russian Extraordinary Commission for Combating Counter-Revolution and Sabotage, or Cheka. The first Cheka head was Felix Dzerzhinsky. He conducted the infamous “Red Terror,” what he called a “fight to the finish” against the Bolsheviks’ political opponents. As part of that campaign he personally approved the torture and murder of thousands. After his death in 1926 Grand Lubyanka Street was renamed Dzerzhinsky Street. A great statue of Dzerzhinsky, weighing 15 tons, was erected in a circle in front of the Cheka headquarters. 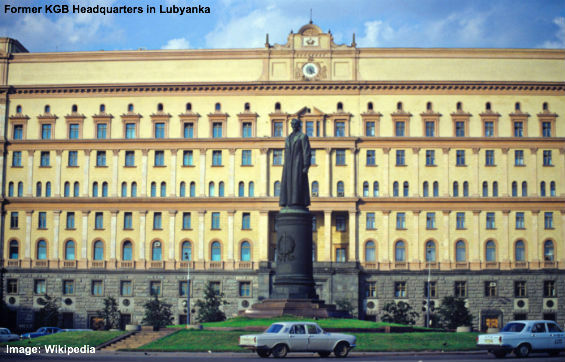 After the KGB was dissolved the building went to the Border Guard Service, later absorbed by the Federal Security Service (FSB), responsible for foreign intelligence. Today Lubyanka looks non-threatening, a yellowish color and architectural style less severe than the harshly grandiose Stalinist architecture seen throughout the city. The KGB faced its greatest challenge in the Gorbachev era. Demands for reform raced beyond Mikhail Gorbachev’s and the KGB’s control. In August 1991 KGB head Vladimir Kryuchkov helped plan the coup against Gorbachev. After the coup’s collapse a crowd gathered in front of Lubyanka and attempted to pull down the Dzerzhinsky monument. City officials used a crane to finish the job. And the KGB effectively ended up taking over Russia. Yeltsin named Chekists, or members of the “siloviki” (or power agents), to important government positions, most importantly Vladimir Putin, who headed the FSB and then became prime minister—and Yeltsin’s successor as president when the latter resigned. After taking over Putin turned to his KGB network to run both the government and the economy. The result, wrote UCLA’s Daniel Treisman, is a “silovarchy” in which “silovarchs” replaced the earlier economic oligarchs. This system offers a tragic detour for people who desperately need liberty. But despite the frenzied push in Washington for economic sanctions and military threats, the success of Putinism is well beyond America’s control. The U.S. certainly should not promote military confrontation with nuclear-armed Moscow over an issue of limited importance to Washington. In fact, Putinism may face its strongest challenge on the economic front from declining energy prices, Western sanctions, and domestic distortions. The silovarchy will not have sufficient resources to buy off the average Russian. Putin’s poll ratings have risen since seizing Crimea, but as the nationalistic fervor fades the Russian people’s desire for prosperity may overcome the desire for order. Finally, the system faces a natural limit: The silivoki will die off. Noted Applebaum, “Sooner or later, the generation trained in the mindset of Andropov’s KGB will retire.” It’s hard to predict what will follow, but change is likely. It then will be critical for Russia’s new leaders to eliminate the Chekist mindset. But Lubyanka should be preserved, perhaps as a museum about tyranny. No one should want to repeat the KGB experience.